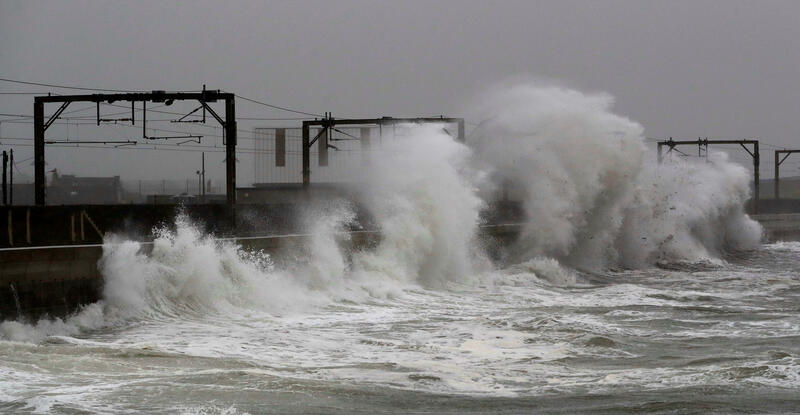 At least two people are dead in Britain as Storm Callum brought heavy rain and flooding on Saturday. Wales suffering the "worst flooding in 30 years," BBC News reports. A person was killed in a landslide in Cwmduad in the county Carmarthenshire in Wales. Police said people should avoid the town of Carmarthen, located in the same county, due to rising water levels. Flood warnings remained throughout Wales. The River Towy in Carmarthen breached the town's defenses and in Milford Haven, the strongest wind in Britain was recorded on Saturday as gusts of 60 mph battered the Pembrokeshire coast, according to BBC News. About 100 sheep washed away in flood waters in Carmarthenshire. Local police in Dyfed-Powys asked anyone to contact them if they see the sheep wash ashore. Severe weather was also recorded outside of Wales. In England, a man died after he was swept into the sea in Brighton and two cars were crushed by a falling tree in Cornwall overnight. About 2,000 homes and businesses in England are without power, according to BBC News. Flood warnings are also in place in Scotland.